An NDA is a legal contract between at least two parties that outlines confidential material, knowledge, or information that two parties wish to share with each other for certain purposes, but wish to restrict access to or by third parties. It’s a contract through which the parties agree not to disclose information covered by the agreement. There are several ways to protect your intellectual property (IP). Protecting your IP should be done using Patent, Trade Marks and other formal ways that do not reveal the most important parts of your venture such as algorithms, source code or formulas to anyone who does not need to know it in order to evaluate your venture or help you achieve something. Protecting your IP is also important for small startups, as reveling the most important secrets should be done only within the very close circle of employees. Often entrepreneurs approach service providers, and sometimes even investors or Venture Capital funders (VC’s), by asking them to sign an NDA. From my point of view, this is the wrong approach for protecting your IP – even if it comes after the patents and trademarks, such a document cannot really protect your intellectual property very well. As evolution is one of the most strongest powers that move our societies, often new ideas evolve only when there seems to be the right climate for them to come into existence or perhaps when there is a gap in the marketplace that this idea intends on filling. As Thomas Hobbes said, “Need is the mother of all invention”. Hence, it could be that your idea, although new and somewhat original, is already in the process of being developed by others. This is not as rare of a circumstance as one might think, since it is very likely that what you may have noticed missing from the market is also being notices by many others at the same time. Just to have the opportunity to hear the general idea or business model of a venture by itself is not reason enough to be required to sign an NDA. For example, seeing an application screenshot that has a great UEX is also not something which needs an NDA. This is usually what you need to show when you meet investors and VC’s. But they will not ask you to reveal your algorithms or show your source code or formulas. So, at the end of the day, it is all about good execution and not good ideas! While it may be easy to copy someone else’s ideas, as it is not so easy to replicate a very successful operation and execution. Because this is a legal document, the party that you are asking for them to sign an NDA needs to have time review the documents with a lawyer. There is no such thing as a simple / basic / general NDA. It is much more complicated than that, the other party has other commitments and binding agreements in play, all of which need to be taken into account when reviewing an NDA. What if you had a chance to meet one of your biggest potential clients, but before you approach him with your idea, you ask him to sign an NDA first? Would this be a good idea? Probably not, your 5 min of glory to get his attention will soon fade once you say the word NDA. 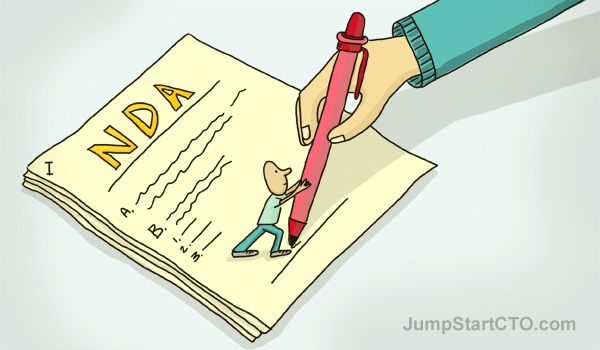 Ask yourself first, why are you asking others to sign an NDA? The risk is that your service providers or investors will not do anything with your idea other than help you. On the other hand, one of your potential customers can turn around and ask someone they already work with to bring them a solution that is the similar as yours. So are you really that protected by an NDA? Your investors might be your best partners in your venture. Did you ask your other partners to sign an NDA? Then why should your investors sign it ?? And one more good reason. Most NDA’s are very vague. They ask you to commit for several years (who knows what will happen within these coming years) and they put you in a position where you are vulnerable as an investor or a service provider to be subject to claims that are made by the other party – even if you did not do anything with the project at all. If you are going to ask someone to sign an NDA, make sure that he or she is about to be part of a very small group of people that are allowed to probe into your algorithms or source codes or, in case of non-technical startups, your formulas. If you are going to have working relationships with an employee or a service providers, during such relations you would like to protect yourself, this is when you should have an NDA signed. The NDA should be specific but not general to such an extent that it explains in detail what you are protecting and what should not be disclosed. NDA in many cases should be about mutual safeguards and protections for the other party as well, to bring the other party to a place where he can feel comfortable with the legal document you are asking him to sign, will likewise mean that he will treat it with respect. Please don’t ask investors, service providers or VC’s to sign an NDA just to hear your idea or to give you some feedback. For many good reasons, NDA’s do not serve your best interests. If you want to protect your IP, it is better that you use patents and trademarks, and most importantly, don’t show the most secret parts of your venture to people, only show the few people to whom you must explain it to in order to get their attention and feedback.